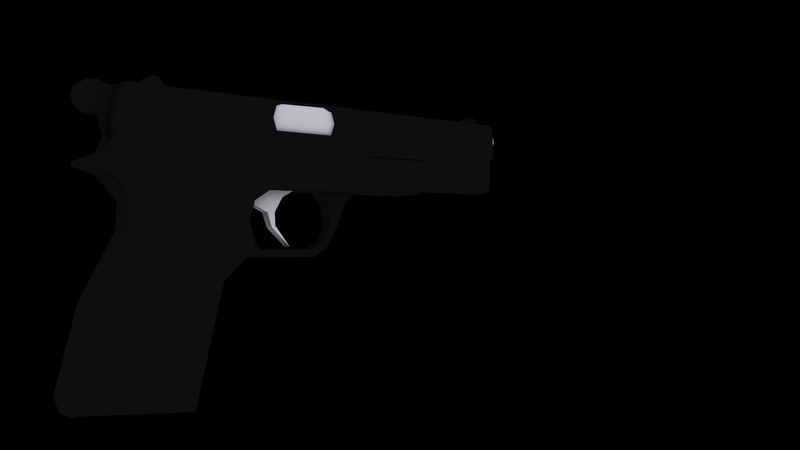 Browning Hi-Power model now modeled. 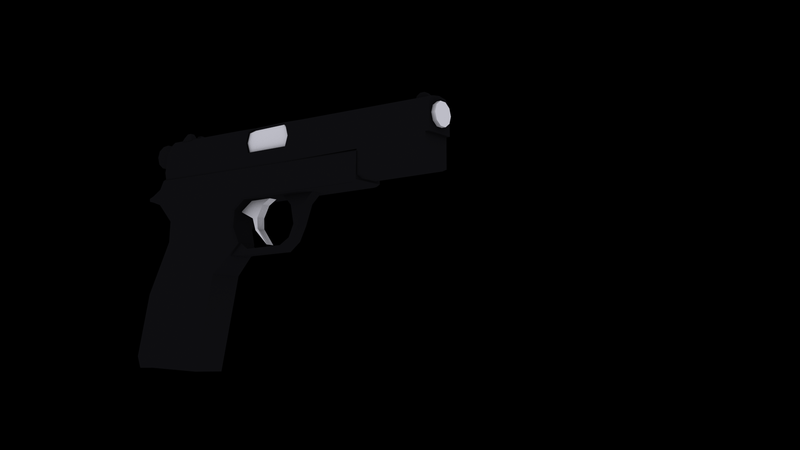 Just needs a few tweaks and an optimization or two before I go into texturing. Banged out the beginnings of another model. So, I decided to get the shotgun actually working. 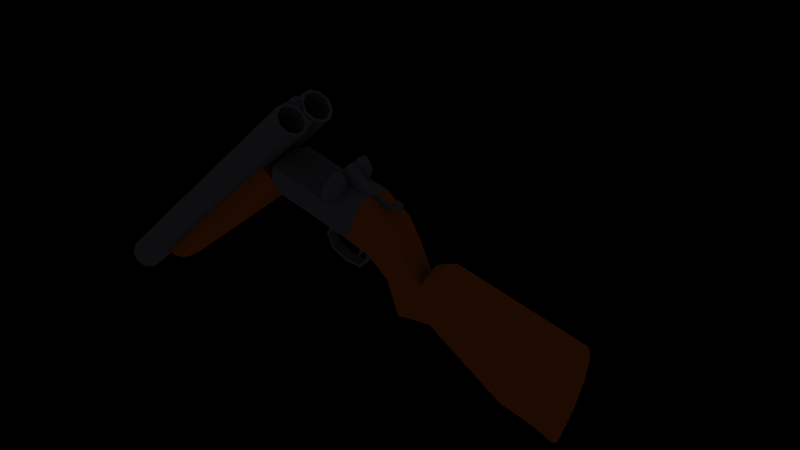 There were some initial headaches in getting everything hooked up, but I now have a, at least, basically functioning Super Shotgun in the game. 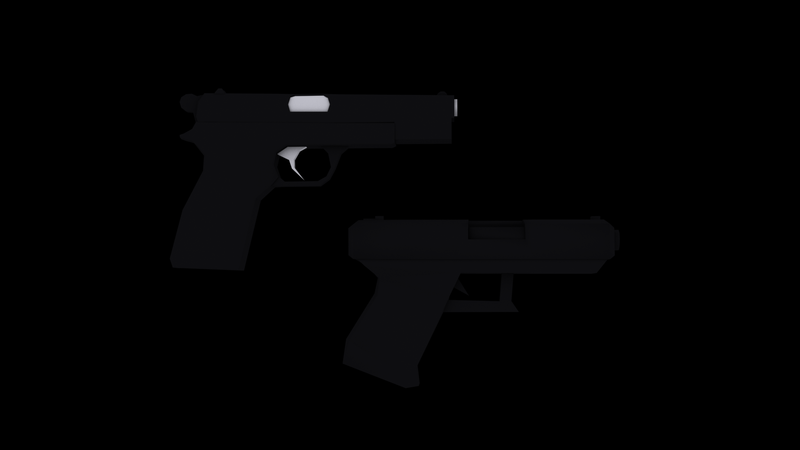 It's currently sitting on the stock HL1*ahem, I don't know why I put HL2...* animations/rig, but it's a functionally independent weapon with it's own spread, rate of fire, etc. That's some interesting stuff you've got going in terms of level and NPC design, but that double-barreled shotgun feels totally out of place. It doesn't fit into HL's miltary/experimental/alien armoury and just looks and sounds wrong IMO. Besides, the alternative fire of the existing shotgun already caters to the "bigger boom" want/need. That shotgun could be cool, but considering it pretty much serves the same function as the alt fire of the original HL shotgun, I think you should make it more unique somehow. I mean, instead of being an improvement, it just feels like you forced "alt fire only" to the original shotgun. It also seems too precise, in order to one shot Vortiguant with the shotgun alt fire, you have to be closer to the enemy than what you pull here. Seems pretty op here. I think we will get an anouncement at E3 on a project with a more or less direct link with Half-Life 3, but can't give a source due to damage control ! No, a true game, single player oriented, and possibly a release late this year ! 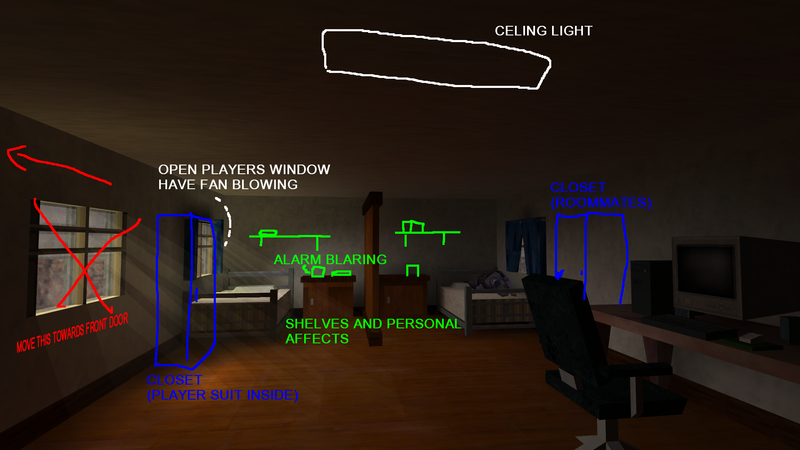 Keep in mind rate of fire and spread are still works in progress. 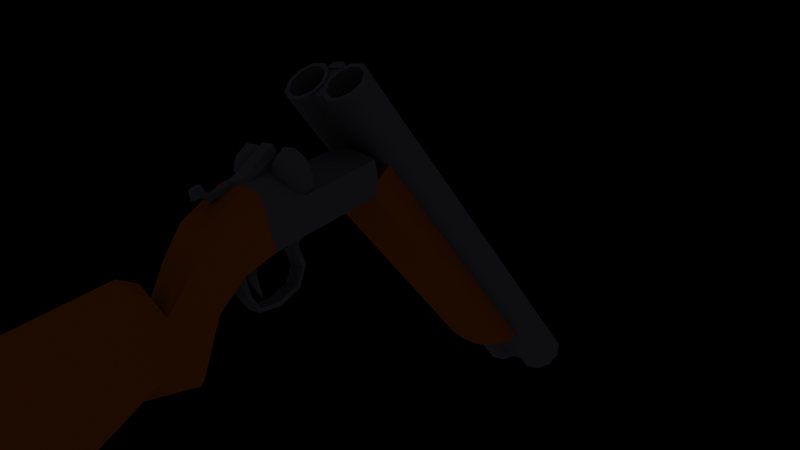 The goal is to more or less emulate the Doom 2 shotgun in terms of functionality. This will compliment some of the new enemy variants, and at range it's currently not ideal. Against the grunts it's only useful for hit and run. As to whether it fits into the arsenal, that is down to the context. 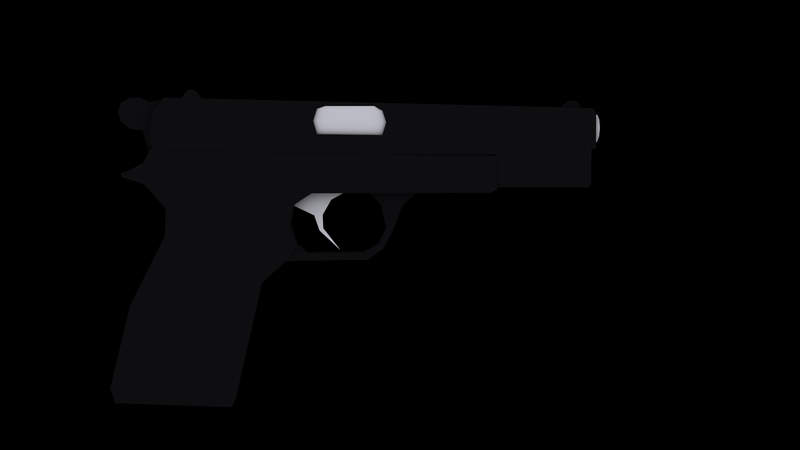 It's a personal weapon owned by a character at the facility. It's not standard issue. TF2 The Card Game. Now with more hats. I think it's the positioning personally. If you were to push it to the right and give it hands it would fit a lot better in HL. Yeah. Right now it's mounted on the stock Half-Life shotgun. 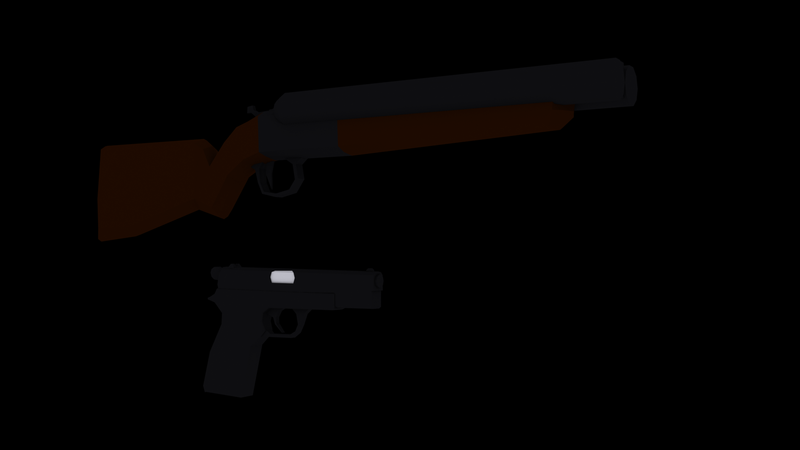 It'll be getting it's own rig and such as development progresses. The master version of the hands will probably come first. I thought i'd share something a little more behind the scenes today. 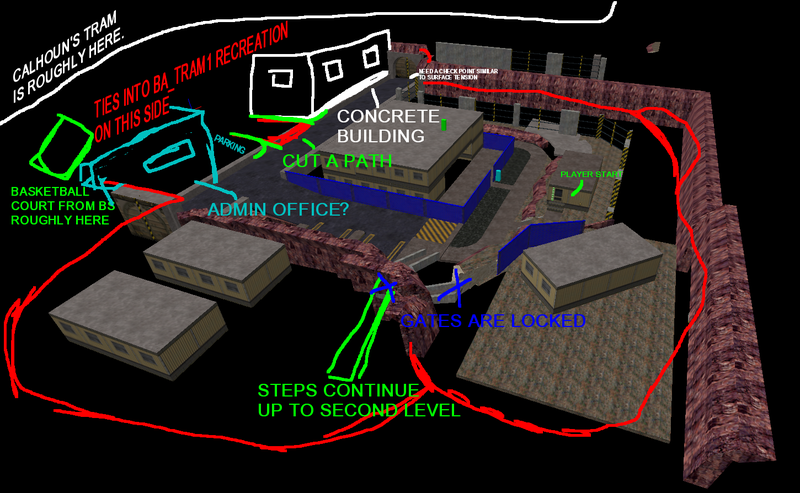 Work in progress level design with notes. Written at like 3 in the morning. This helps me when i'm burning the wick at both ends and I don't want to forget what i'm trying to do. 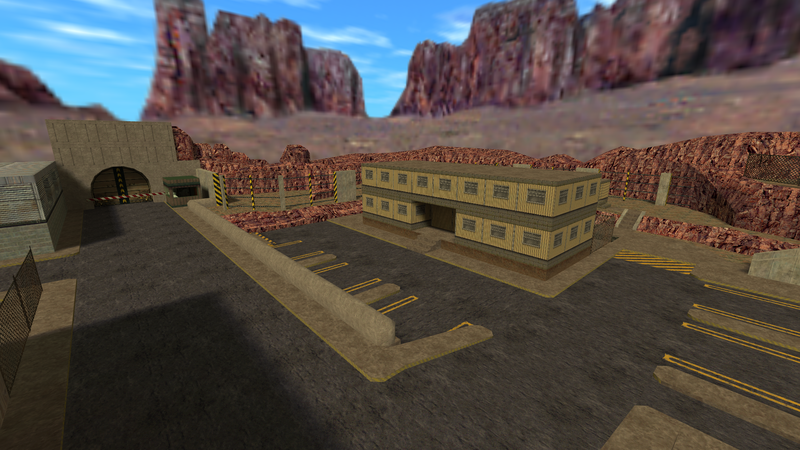 First, the starting area of the game. Like I said in previous posts I wanted the game to start in the Area 8 Topside Dormitories. These are mentioned and only briefly glimpsed in Blue Shift. 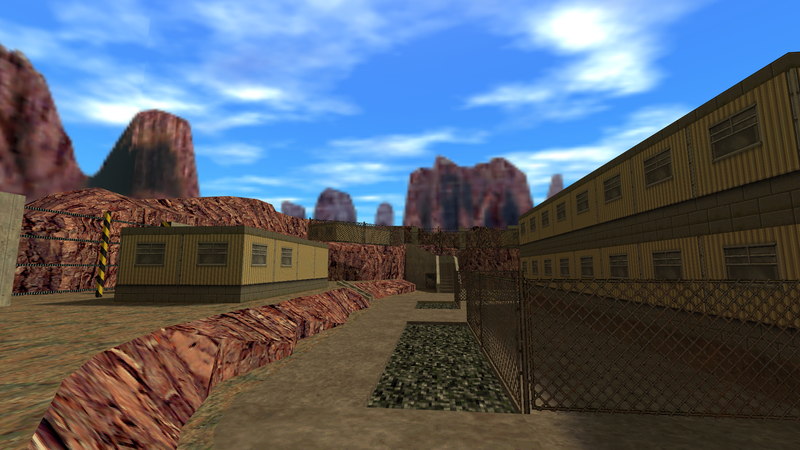 My interpretation of them is a peppering of buildings in and around the Black Mesa Transit system. Almost having the feeling of a construction yard, shanty town, and a college campus. A lot of personnel live in portable housing. Some are either partnered with a roommate or will live in one of the larger dormitory facilities. 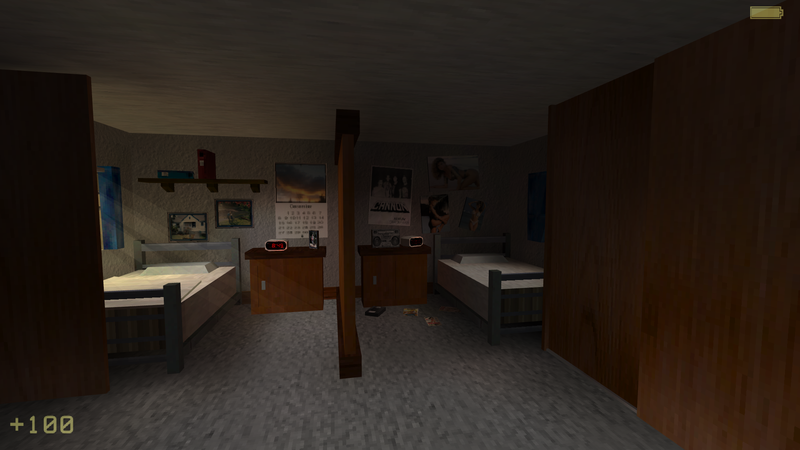 This is the interior of the player's housing. You share living space with another person. As you can see it's not too bad. Each person has their own personal space separated by a privacy wall. There's shared computer/network access. Most other amenities have to be procured from the base itself. The mini fridge is actually something your room mate and you had brought in, to the envy of other personnel who hate having to run over to the commissary every time they want a drink. My goal is to make just about everything interactive. Just to give it life. Obviously liberties will be taken to a degree. 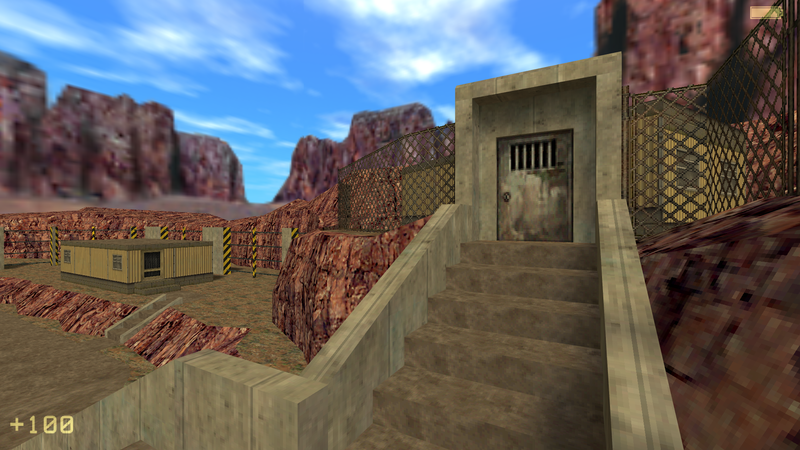 If you're familiar with the Hazard Course areas seen in Opposing Force, you know that they added a few doors that weren't there in regular Half-Life, there will be differences along those lines. I'm hoping structurally it'll all line up as close as possible. 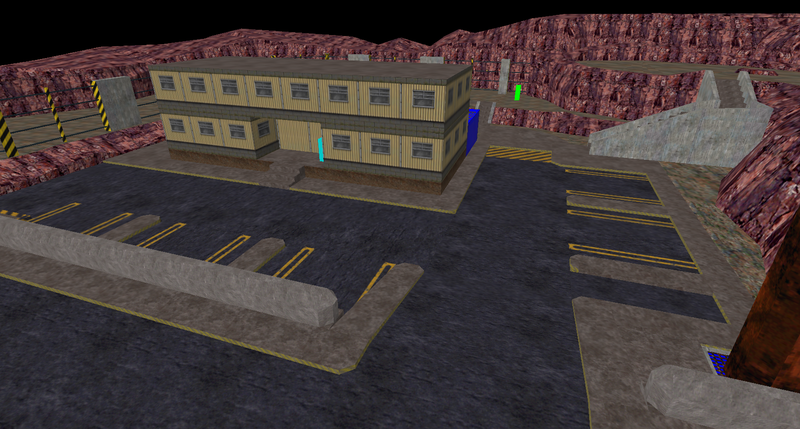 Here's a couple more unmarked dev images from the map thus far. Big changes to come will be the rock faces. 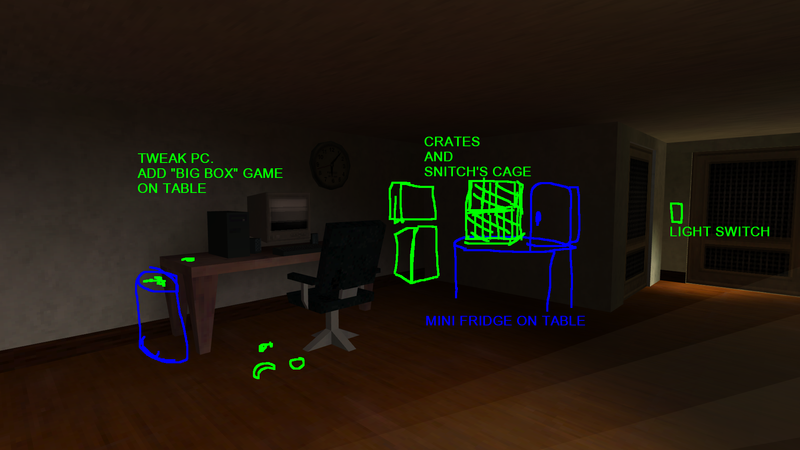 I'm trying to emulate the way that Valve and Gearbox did their walls. A lot of the tutorials out there for doing terrain push the poly limit very high. They look nice, but they wouldn't match the original Valve aesthetic. 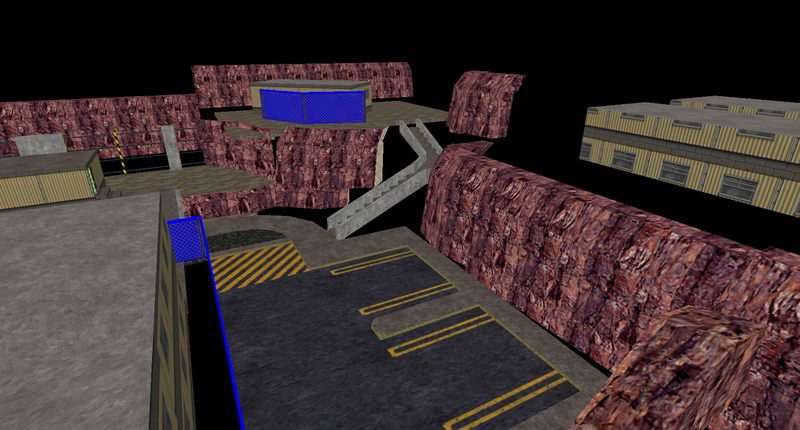 So keep in mind a lot of the rock faces are more or less placeholders to give myself a sense the shell of the level. Day 7485828. The siege continues. Most of the work yesterday was working on the cliff faces. There's more terrain detail to do, but the outer wall is now ready to be sealed with a sky box. 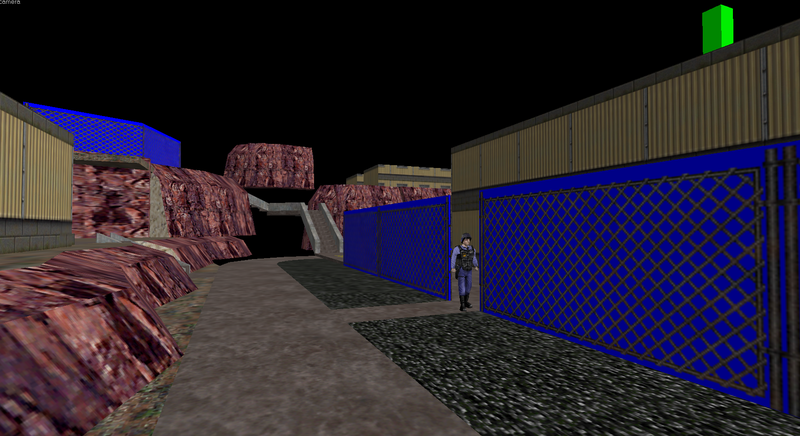 I plan to add some power generators over in that empty area behind the barriers(to the north in image 2). Some bits of rock, a few bumps in the terrain. The faux houses willl be detailed and placed into the map after that. Some street lights, signage, cars, NPCs, and scripted events. All to bring it to life. Just for some trivia there are currently 250 objects for the cliffs. Triangles. Triangles everywhere. 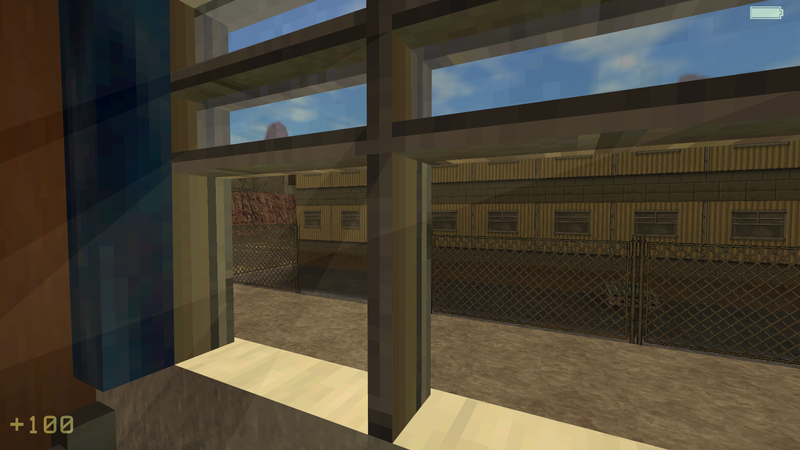 A looksee at some of the custom textures i've been building. 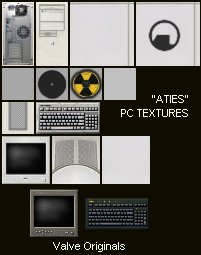 I really wanted a solid mid-late 90s Desktop PC texture set that would blend pretty well with the Black Mesa content. I used a couple of stock Half-Life textures and a few reference photos, and I think I got something looking pretty reasonable. Progress continues on all fronts. The exterior structure is more or less complete. I have a few more details and some tweaks to make.Night-time lighting system, a generator area with some power lines running out. Cars, NPCs, etc... Those will be more near the tail end of the design as I want to make the place seem real before I implement any monsters. I think this will blend fairly well with Blue Shift's opening area. The interior is also coming along quite nicely. A few details to work out here and there. Also the ferret is named "Snitch" and he will play a small role in the mod. At one point he'll act as a pseudo-guide, and he may drop you some ammo from time to time. Integrated the housing area into the main map! 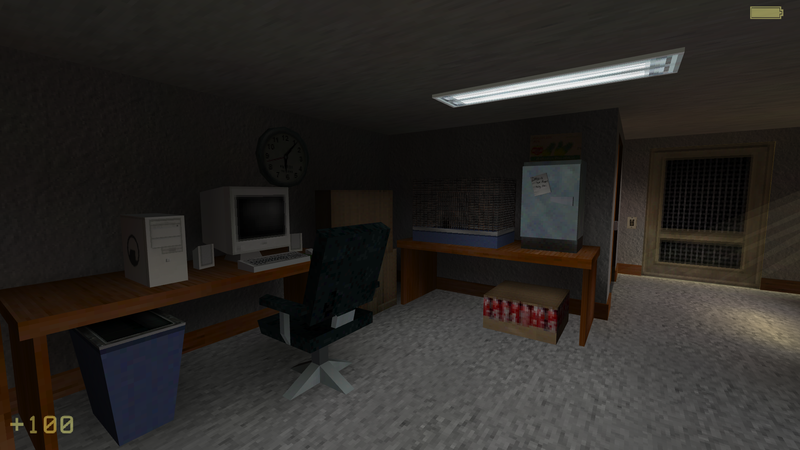 Custom textures mixed with original Half-Life textures. Giving a distinct feel to both living areas tells us a bit about both characters. Joe, our character, is a bit more uniform than his room mate, a security guard with the name "Dewey." Dewey's a bit of a scatter brained Vietnam Veteran. More naturalistic lighting in the bathroom now. The bathroom nightlight is a nice touch. 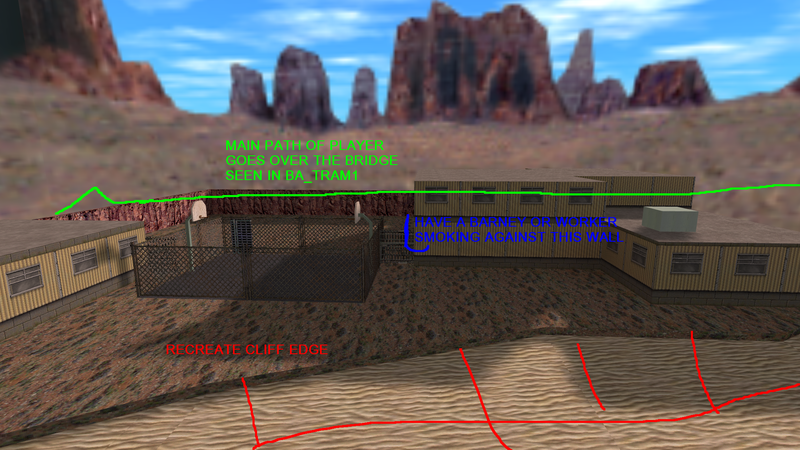 Do you have something against bilinear texture filtering? Yeah. It does some bad things to transparent textures. I run Quake and Quake II the same way. I'm not a fan of the filtering. 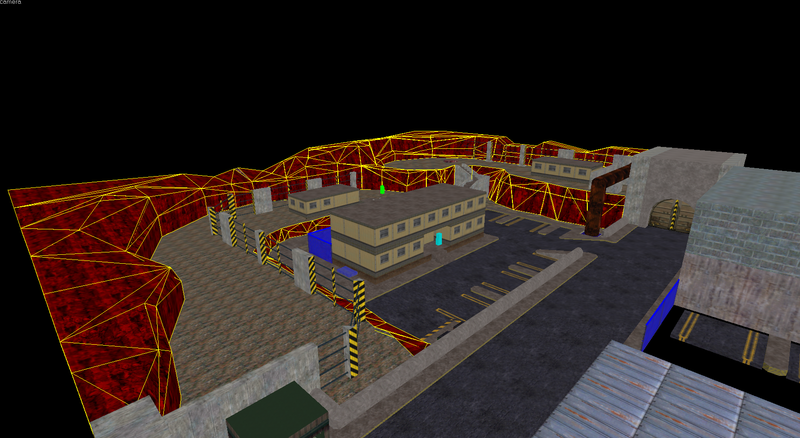 So has anyone ever deciphered the map filenames for the original Half-Life? It's something that's always bugged me but I could never find an explanation for it anywhere. x = chapter number, y = area number, z = individual map files (not all have z, for example, the first map in the c0a0 series is c0a0 that leads to c0a0a while the first map in the c1a1 series is c1a1a that leads to c1a1b). Area number corresponds to each chapter in the New Game list (c0a0 is Black Mesa Inbound, c0a1 is Anomalous Materials, c1a1 is Resonance Cascade, c2a5 is Surface Tension, and so on) but there are a few odd cases such as Residue Processing and Questionable Ethics (both are in the c2a4 series, but Residue Processing starts at c2a4 while Questionable Ethics start at c2a4d) as well as Xen, Gonarch's Lair, and Interloper (Xen is c4a1, Gonarch's Lair starts at c4a2, Interloper starts at c4a1a. Looks like they were shuffled around during development). I have no idea what the chapter number correspond to, but I do have an idea. 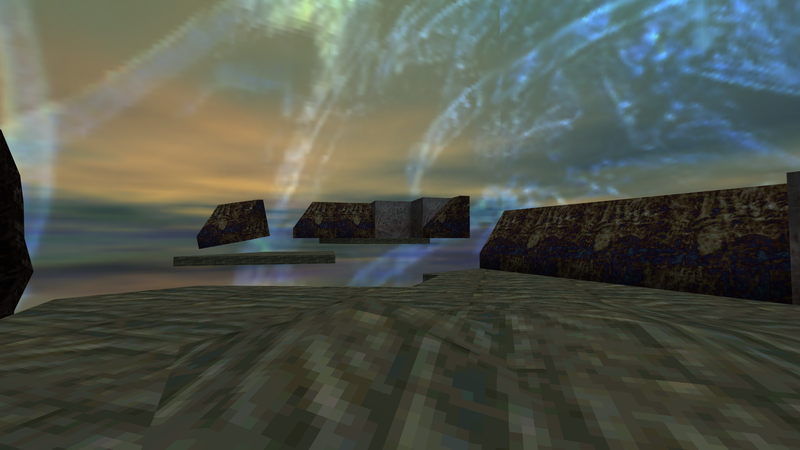 Chapter 1 (Resonance Cascade until Blast Pit) is about getting out of the initial lab areas, Chapter 2 (Power Up until Surface Tension) is about getting to the surface, Chapter 3 (Forget About Freeman until Lambda Core) is set around and inside the Lambda Complex, and Chapter 4 (Xen until Nihilanth) is entirely within Xen. Uh, there is no c0a1, c0a0 -> c0a0a to c0a0e and then c1a0(Anomalous Materials before disaster) -> c1a0a to c1a0e and then on c1a1 (disaster happened, Unforeseen Consequences). c3a1, c3a1a, c3a1b 	"Forget About Freeman!" c1a3, c1a3a, c1a3b, c1a3c, c1a3d  "We've Got Hostiles"
c4a2, c4a2a, c4a2b 	"Gonarch's Lair"
Not sure what happens about ST chapter, with extra w and x map. 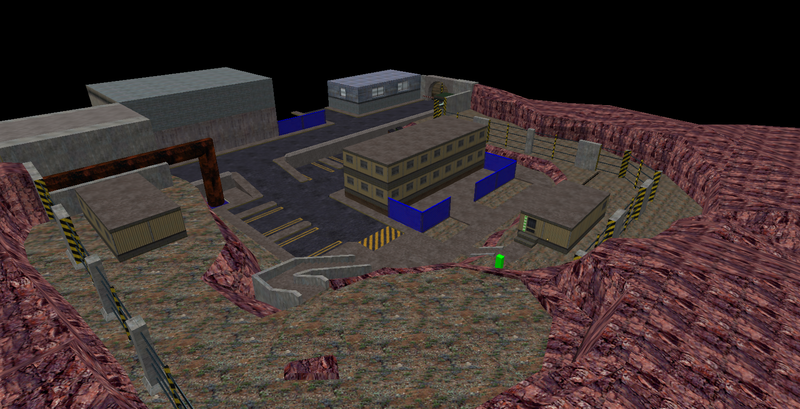 Also, the map filename seems based on the alpha version of HL1(0.52, with some unnamed military facility setting before changed to Black Mesa), but sure changed a lot. Thank god they used a more sensible filename system when the sequel came about. Incidentally, what name format did Gearbox use? 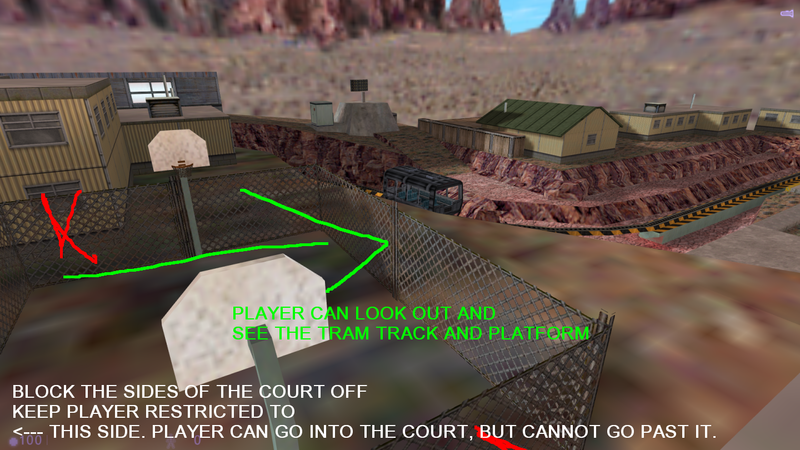 I don't think the HL1 map file name system isn't sensible, since it still "chapter X, area Y, number Z of level"-style. 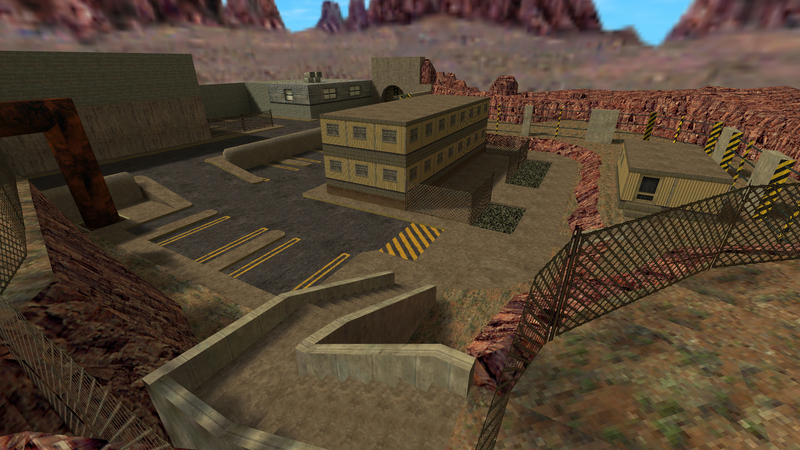 Gearbox was still using the same style of HL for map filenames in Opposing Force. I wonder why they changed formats. Did the Dreamcast versions of the HL maps take on a new naming scheme or were they still the same? The map names always made sense to me. I've memorized C2A5 as the start of Surface Tension action. Whenever I want to blast some enemies or test a mod I automatically go there and follow it with good ol' "impulse 101". 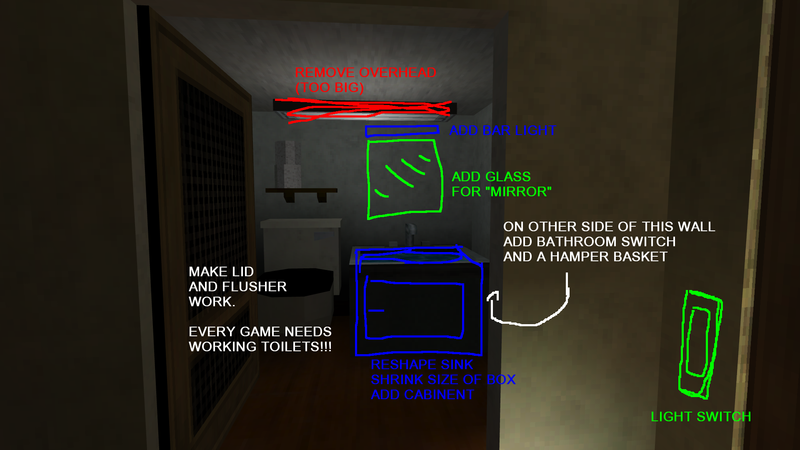 I don't have the original leak version, but someone's mod verison based the leak seems using original HL map filenames. Even their PS2 version of HL still using original map filenames(with .bs2 extension), so it's very likely they did not changed filenames in DC version too. Project Borealis update 3 teaser. Other bits on the sound design front, i'm trying to emulate the Human Grunt audio for a few more specific pieces of dialogue the player might over hear. It wouldn't be possible to replicate these using the stock audio VOX, but i'm working on trying to approximate the grit and radio effect. I took a listen to what the Human Grunt sounded like in a YT video. I'm sure the radio static and Squelch open/close hiss is easy enough for you to do. To get that "grit" you mentioned on the voice you can try using the overdrive function in a tube type guitar amp plugin for your sound program. It will give a voice the sharp edge. Between tweaking the amount of overdrive and EQ settings you can simulate a wide variety of comm audio. I'm not sure how it was done originally. Maybe very fast thin pulses of tremelo was applied to the voice to make it choppy/edgy. This is a test I made a while ago for a project. No static or radio sounds yet. Just the voice with overdrive and EQ like I mentioned before. Its got what I think is the gritty sound you want.